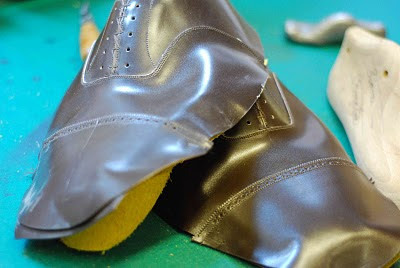 Onto the next stage of the bespoke shoe process this week, with the clicking (cutting) of the leather. It turned out my shoes had already been clicked and closed (sewn together) – that’s them above, a half brogue in espresso brown. So to demonstrate the clicking stage John Carnera cut another pair to show me, in this case a pair of half brogues in black calf. John is largely retired now but fills in when there is a lot clicking to be done, which is the case at the moment with George Glasgow and Dominic Casey just returned from Cleverley’s tour of the US. The four staff at Cleverley’s can switch between most of the jobs, but they all have their specialities. John trained as a cutter and pattern maker, for example, while Teemu, whom we saw in the last post making my lasts, is best in that role. Adam Law, just finishing his traineeship, can do both roles while Dominic does the bottom making. Only the closing has no overlap, all done by four different closers scattered across England. Cleverley uses Freudenberg leather, made by Weinheimer Leder. This used to be made in Weinheim but production has switched to Poland. It is largely chrome tanned. In John’s view it is “the best leather we can find anywhere in the world”. The skin here is 17.5 square feet, slightly above the average of around 15. Generally a smaller skin is better as it means the calf was younger and will have more pliable skin. The best part of the calf is the rump. It is less marked generally, stretches less and has an even thickness. So it is used for the most visible part of the shoe – the upper. The two uppers will be cut either side of the backbone, in a mirror image of each other. This is so they are as similar as possible and because each has to be cut ‘tight’ from heel to toe. The ‘tight’ line runs in an imaginary curve around the belly of the calf, starting at its front leg and finishing at its back. 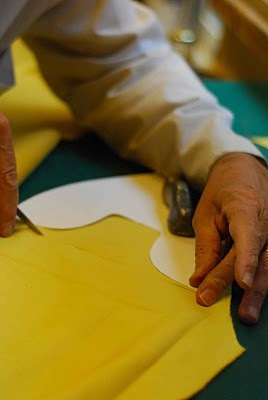 The parts of the shoe must be cut so that this line runs down the shoe, to minimise the chances of the leather stretching (and stretching unevenly). John is demonstrating that curve above. Usually three pairs of shoes are cut from each skin, so one set of uppers is cut at the bottom of the rump, one more just above it and a third either side of the first pair, towards the outer edges. Then the sides are cut, further up the skin. The outer one of each pair is prioritised, again being slightly more visible than its inner partner. “Though the only person that would probably notice the difference is me.” So two sides either side of the backbone, and two more just above it. Four more, for the other two pairs of shoes, will be cut around it. The outer side is also a slightly different to the inner, having a tab at its end to overlap on the heel. Next, the lining of the shoe. The back half is lined in the same leather as the uppers, which is just a house style. One side of this lining is made slightly longer than the other, so that they join at a different point to the outside of the shoe. This makes the shoe stronger and more comfortable. 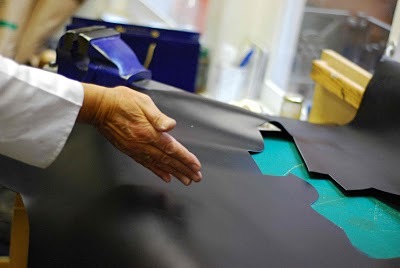 The front half of the lining, being against a man’s toes and joints, needs to be softer and so is lined in horsehide that is tanned to be much spongier. That’s the yellow-coloured skin being unwrapped above (the horse is bigger so this comes in two halves, split at the backbone). 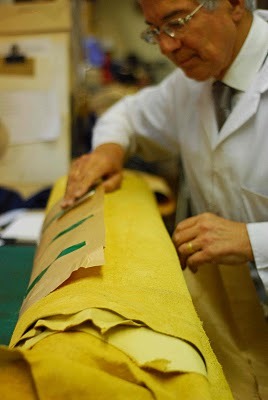 Tongue linings are cut from that horse leather as well. As to the cutting itself, it doesn’t have to be too precise as it leaves two or three millimetres all around to provide some slack for the closer to work with. Indeed, the front lining is cut straight across the U-shape of the upper, leaving a lot of excess (below). 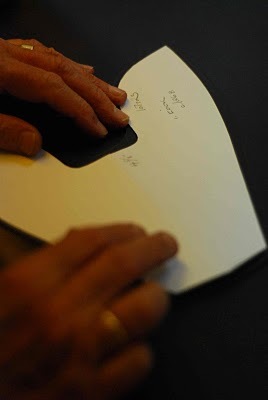 You can follow the discussion on Bespoke shoes at Cleverley: Part 5 by entering your email address in the box below. You will then receive an email every time a new comment is added. These will also contain a link to a page where you can stop the alerts, and remove all of your related data from the site. I’m curious about the cutter’s opinion regarding vegetable vs chrome tanning. It seems either variety can come in a range of quality. Is there any objective difference in favoring one over the other? Or is it simply a matter of overall quality and customer (or in this case, manufacturer) preference of certain strengths of one type of leather over the other for a given use? AP, there is indeed a big range of quality in each type. And the biggest advantage to something that contains more vegetable tanning is the way it ages. Slightly less important in shoes, given how much they are polished, but more important in bags etc. (see post on Bown Bags). “All leather used to be tanned with vegetables, especially with bark of different tree types, oak, willow etc. This process used to take months to make. Today, most of the leather is tanned with chrome or a combination of both. Tanneries today wouldn’t have the resources to make bark or their tanning solely by vegetables. This is mainly a domain for smaller operators who cater for specialist fields such as allergy sufferers and shoe restoration etc.